At the start of the year, I made the switch to the iconic, near-barefoot toe shoe. This has been a gradual process. Moving to a minimalist trail shoe about 2 years ago and ditching my orthotics about 18 months ago proved to be easy. I had come across Chi Running during that period and picked it up easily — one hidden benefit of the orthotics was that I was unable to heal strike. I had already changed my stride to a toe-midfoot strike. 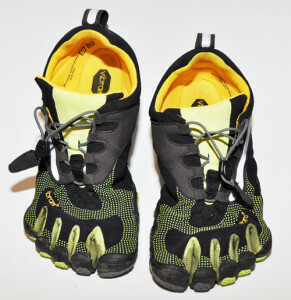 Just after New Year’s Day, I was in REI’s Bargain Basement and found many pairs of Five Fingers that had been returned. Bought this solid pair of KSO for $20. REI Bargain Basement Beauties scored for $20! These at first were great. Lots of stair training to start off the new year. I am psyched to be participating in the Big Climb up Columbia Tower, Seattle’s tallest building, on March 25. The downside of the KSO is running when it is wet. In Seattle, that means all winter guaranteed. After a second soggy 10K the KSO upper fabric had stretched and caused the sole to rub in a few painful places on each foot. Blister city. Thank you KSO, I will see you again in rainless July. Back to REI, no more Bargain Basement beauties left, so I bucked up and went upstairs to try on a pair of Bikila LS. The improved fabric on the upper and between the toes has made a big difference. The running inspired bottom is awesome. I have put about 70 km on them so far and not a single blister. Interestingly, these are a size bigger than the KSO pair, and overall, more comfortable. I found it worth taking the time to try them on and did not even mind paying full price with the famous REI guarantee. Big fan of the Bikila LS. If you are looking at a pair for running check these out. Bikila LS after a 10 mile trail, beach, stairs run. 1) Read Born to Run. Great book and will inform and inspire. 2) There is an adjustment with your body. My legs look a few weeks to get comfortable with no drop from a minimal 5-10 mm drop. It was never painful, just working muscles in new ways. Some people consider it a con. Chi Running, Pose Method or even 100 Ups all preach a basic truth: Do not run on your heels. 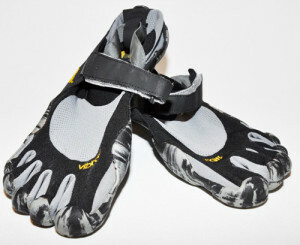 3) Vibram Five Fingers are machine washable. 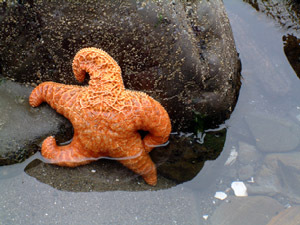 Great to know that I can go get wet and dirty. Both pairs clean up well. My toddler-aged son has loved the climbing walls at various playgrounds around Seattle this summer. With the start of the rain, which should stop sometime in April, the playgrounds have been a little wet and cold. 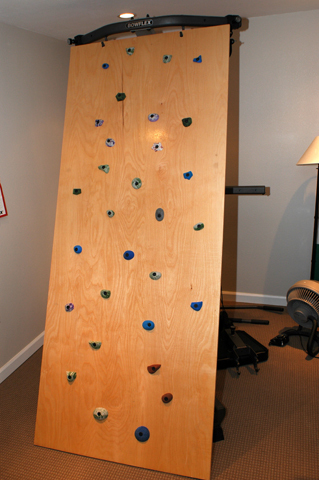 I wanted to encourage this new love since it combines physical and metal challenges and came up with the idea of building an indoor climbing wall. I did not want to get too over the top with bolting boards to my new refinished basement. Instead, I thought that attaching a 3/4″ plywood board to the Bowflex might be a better bet. A little online research led me to some great instructions at Three Ball Climbing. REI had a very reasonable set of bolt-on chips by Metolius. It turned into a great father/son project. The only thing better was the boy getting all the way up to the top within the first ten or so tries. I came across the Handpresso while shopping at the Seattle Flagship REI store. It is truly portable. Hand pump operated and uses the standard Easy Serving Espresso (E.S.E.) pod. This is a device that I would actually take into the backcountry. Pack-in/Pack-out does not work well with loose coffee grounds. Way too much mess. Pods are better in that situation. I have used them like tea bags on past backpacking trips and it works fairly well. The Handpresso is an ideal for a car camp or low key camp trip. Mother Nature does not care what logo is on the side of your tent. First camp trip of the year was literally a wash. The wife and I are avid backpackers. We have tackled adventures in the Yukon, Alaska, Glacier NP and Patagonia. The addition of children has compromised our backcountry adventures a bit, but we still enjoy a car camp and light hikes with the kids. With a bigger crew, we recently bought a bigger tent. Our decision was made on size and price. The ALPS Mountaineering Meramac Tent fit the bill and was purchased from REI-Outlet. In the Pacific Northwest, if you camp you are going get wet. Especially early in the season. Heading over the Chinook Pass through Mt Rainier NP, we found the Little Naches campground in Wenatchee National Forest. Great campground. Clean and large camp areas. Plenty of space for multiple vehicles at each camp area as well. Basically good for families. The Naches area of Wenatchee National Forest is gorgeous. A different feel from the wet side of the pass. More pine trees than fir. The rivers were full of runoff and the lupine was beginning to flower. The weather, however, was bi-polar: Warm and sunny or heavy rain and thunderstorms. The latter are fairly rare in the PNW. The ALPS Mountaineering tent was incredible in the weather and would highly recommend it. Totally dry through not one, but two thunderstorms. Study too. Not a second thought to throw the kids in the tent and listen to the wind and rain. The count between lightening and thunder with the kids was priceless. ALPS Mountaineering is not a brand name by any means, but then, Mother Nature does not care what logo is on the side of your tent. REI has adopted a plot of Discovery Park in Seattle and held a volunteer day today to help restore the habitat. As a frequent park user, I was glad to help plant snowberry bushes and mahonia. Felt good to get out an turn some earth on a windy and cool day.